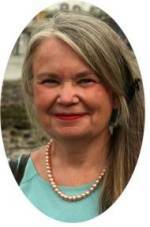 This comprehensive article on the famous Golash Brooch, which contains two quahog pearls, will help you understand the value and rarity of these natural pearls. 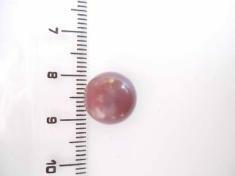 "The diameter of the pearl is 14mm. 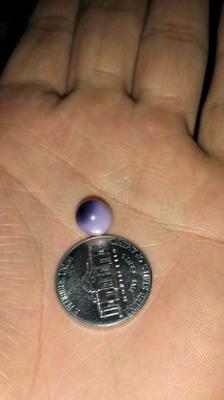 Generally most quahog pearls have an average size of 5-6 mm. 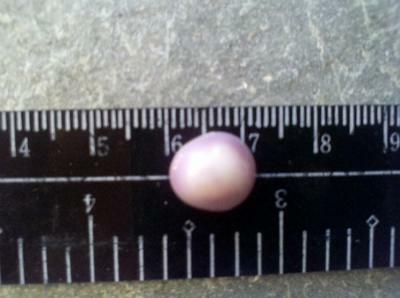 Thus a 14 mm pearl is considered as exceptionally large for quahog pearls. The combination of exceptionally large size and extraordinary quality, makes this quahog pearl an extremely rare pearl indeed, worthy of being listed as a famous pearl. 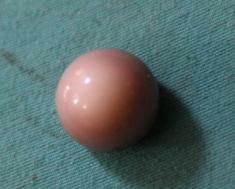 The size of the pearl in terms of its weight is approximately 2.7 grams, equivalent to 13.5 carats or 54 grains. 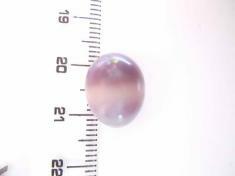 In terms of its weight too the pearl is undoubtedly exceptional when compared with the average weight of most quahog pearls." 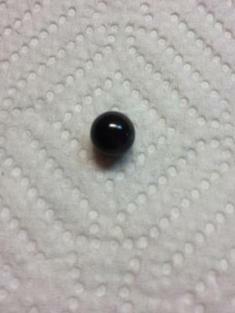 John Piper says that quahog pearls are amongst the rarest of gemstones. It is thought that only 1 in 5,000 clams produces a pearl but, before a pearl can be considered valuable, it also must possess visual appeal – many pearls are misshapen, or not particularly pretty to look at, which precludes their use in jewelery. 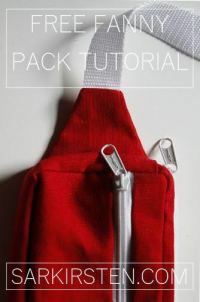 This makes those pearls which are suitable for use in jewelry that much more valuable. Despite the huge commercial farming activity which processes millions of quahog clams every year, pearls are increasingly rare because of the automated nature of the process. Clams are cleaned and shucked mechanically, and this process typically destroys any pearls which may otherwise be uncovered. Kunz has this to say about quahog pearls in his 1908 book on pearls. 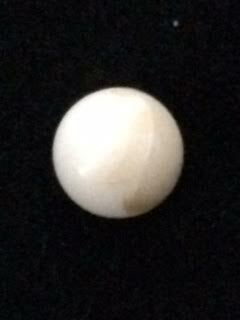 Pearls also occur in the quahog, or hard clam (Venus mercenaria), of the Atlantic coast of the United States. Although these are rare, they are generally of good form, and some weigh upward of eighty grains each. They are commonly of dark color, purplish, ordinarily, but they may be white, pale lilac, brown, and even purplish black or black. Fine dark ones have a high retail value. They are often referred to as "clam pearls". It is not unlikely that the Indians of the Atlantic coast may have known of pearls from the common clam as well as from the edible oyster. 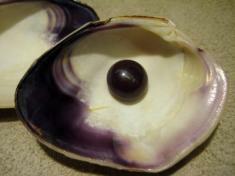 The former may have often contained pearls weighing from fifty to one hundred grains each, as at that period the mollusks were permitted to attain their full growth, and perhaps were not eaten except when they were as small as little-neck clams; the larger ones were sought for the purple spot which held the muscle, and was used for wampum. 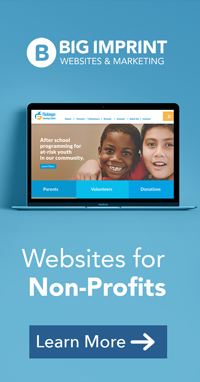 More quahog pearls that have been found. 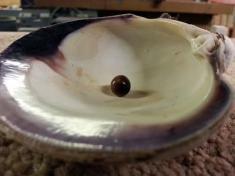 See quahog pearl collection photos. These quahog pearls have sold. 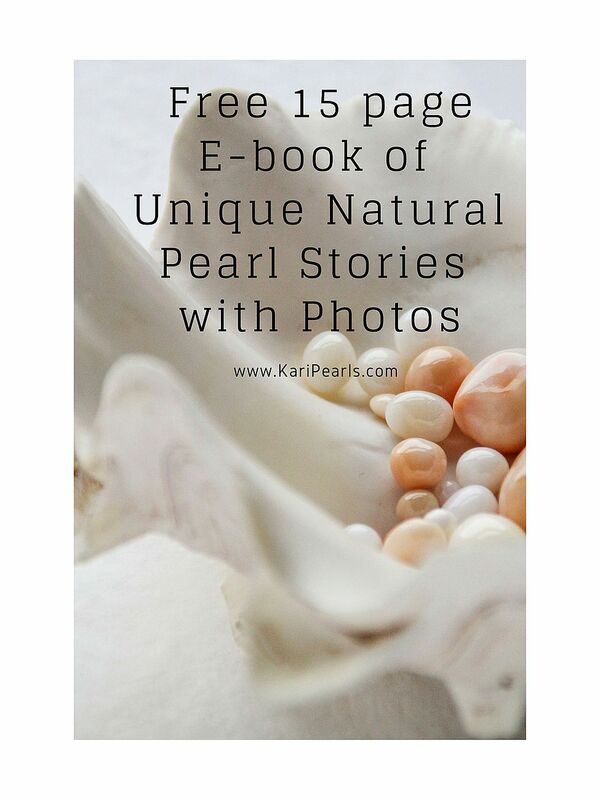 Go to main natural pearl catalog page.